Previously part # RTP (but now automatically configures VDD pin). Standard with Maxim DS18B20 sensor. Automatically configures the VDD pin to the correct state. The OW-TEMP-Bx-xxA temperature probe is designed for wide temperature range applications requiring sensor submersion and/or excellent chemical resistant properties. The probe is resistant to acids, alkalis, ketones, esters, aliphatics, aromatics, and outdoor exposure. It is constructed of 304 Stainless Steel making it both durable and water resistant. The cable used is constructed of TPE based materials for both the outer jacket and inner conductor insulation. It is particularly suited for harsh environments, and offers excellent resistance to high and low temperatures, oil, gasoline, and sunlight exposure. All of this results in a robust sensor which can be submerged beyond the top of the steel probe. The sensor is equipped with a DS18B20 1-Wire temperature sensor embedded into the probe. In manufacturing the temperature probe a special process is used which insures the internal sensor is thermally coupled to the steel tube wall; this helps insure rapid thermal response to changing conditions. The probe is designed to make the installation process as fast and error free as possible. It is the first 1-Wire probe to automatically identify whether external power is being supplied to the VDD pin and then configure the sensor appropriately. Furthermore, it is terminated with a RJ12 plug which commonly makes installation much easier. The probe is directly compatible with all Embedded Data Systems and Maxim 1-Wire bus masters, as well as our OneSix server software and the freely available TMEX drivers. For complete documentation on the embedded DS18B20 sensor, please refer to the manufacturer’s DS18B20 spec sheet . Dimensions (body diameter) BDia .216 .218 .220 In. 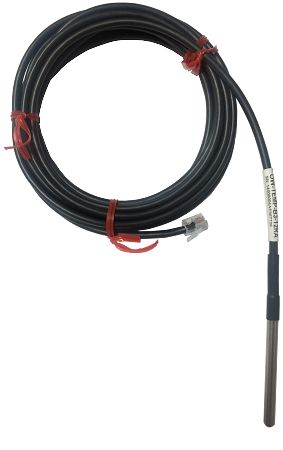 Our standard OW-TEMP-Bx-xxA sensor has a 3 inch long steel probe and 12 foot long cable. 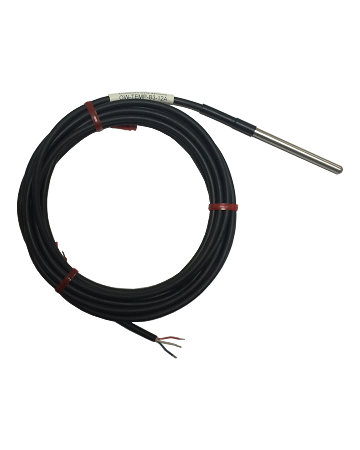 With minimum orders we can manufacture the temperature probe to a variety of specifications, including length of the steel probe, length of cable, with / without RJ12 plugs, etc. Please contact us for a custom quote. Q: I see it comes standard in 12' long. I need 25-30' so could I get 25 or 30' and how much would that be? Can I connect it with CAT5 cable to extend the length if I wished? Cable termination - RJ12 Plug or Bare Leads? Please email these details to sales@embeddeddatasystems.com, and we will provide you a quote. In regards to extending the cables with CAT5, you are welcome to do so. I would however suggest having the Data and Ground line utilize the same twisted pair. Q: Can temperature probe be manufactured with a 3 Pin M8 Connector? A: We are happy to quote custom connectors on the OW-TEMP-B probes. To provide a quote please email Sales@EmbeddedDataSystems.com the quantity required, whether the M8 Connector should be male or female, and any other requirements regarding the 3 pin M8 connector.